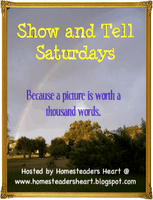 My lovely friend Kim at Homesteaders Heart started a new meme for Saturdays called Show and Tell Saturdays. Sounds like fun to me! This week's theme is Antiques. This is a special one for me and I am happy to have a reason to post about it. This doll was given to me when I was a little girl (first grade maybe?). What makes it so special is that it belonged to my Mother when she was a little girl. That makes it at least 60 years old! For one of my birthdays, my Mother and my Grandmother took the doll to someone to have it fixed up - new wig, cleaned up and I don't know what else was done. I loved her! Her head, arms, and legs all move around and she came with a cute dress, shoes, coat and hat. Some of the items have been lost over the years. Now that I look at her, she could use a bit of repair. I'm glad I was able to share her with you. She stays tucked away in a cedar chest for now. Maybe someday I'll be able to pass her on to a special little girl. And I think I might even have that book about a girl and a doll packed away in a box - I'll have to look. Stop by Homesteaders Heart to see more antiques and link up if you have one to share! OH I love it. She is so precious and what a great story to go with it. I think you make a lovely Lisa! Hugs to you my friend and thanks for joining in today! I did not take a picture of my doll that was my mothers. I should have done so. My doll is also an Elizabeth. She is 100 years old. My grandmother made her for my mother's first Christmas which was in 1909. Oh Lisa, she is precious. 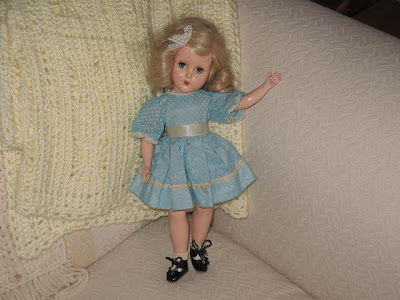 I think at some point I'd like to get my little girl a very special doll that she will have and give to her children. Unfortunetly for me, I didn't have one I would pass along! Such a beautiful doll and I loved the story to go with it. And if I had ever had a daughter I was going to name her Elizabeth. Alas, I have Rusty, Stephen, & Jonathan. Maybe someday I'll have a granddaughter named Elizabeth. Thank you. That was a nice blog today. I think I like show and tell. 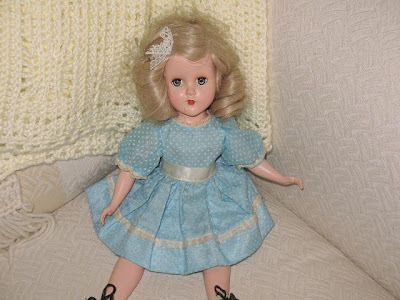 i have a holly hobby doll that i got when i was a baby, but i guess it would only be considered vintage. btw, i luv your chocolatey background! did you design it yourself? i prefer having my blog be the stretchy template, but i can't find cute backgrounds for stretchy, only minima. Oh how pretty! I love her. And the Elizabeth story. I wanted my name to be Patricia growing up. I don't know why. I just liked the name. I wanted to play along, but felt too bad to get it together. Oh well, maybe next Saturday.